8 1/4 in. x 10 3/4 in. 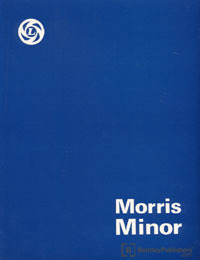 This Morris Minor service information includes wiring diagrams, maintenance tables and technical data. This manual has been prepared to provide the service operator with the necessary information for maintenance and repair; it also serves as a reference book for service supervision and covers items of procedure for the guidance of both the fully qualified and less experienced mechanic.